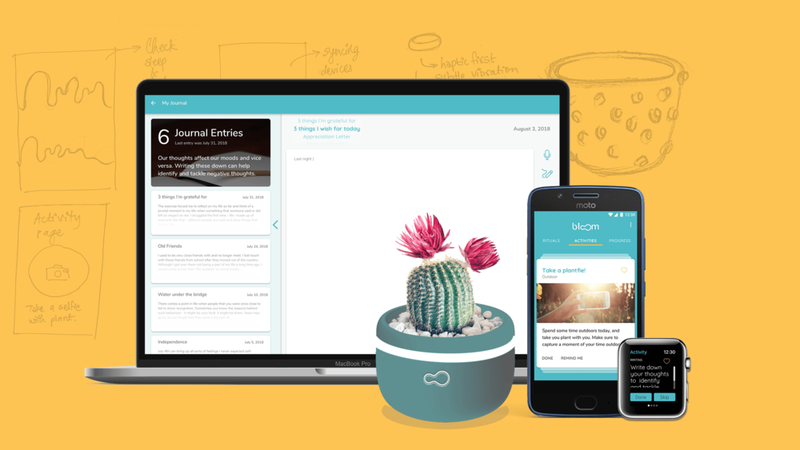 Bloom is a connected device service to help working professionals and higher education students dealing with General Anxiety Disorder. 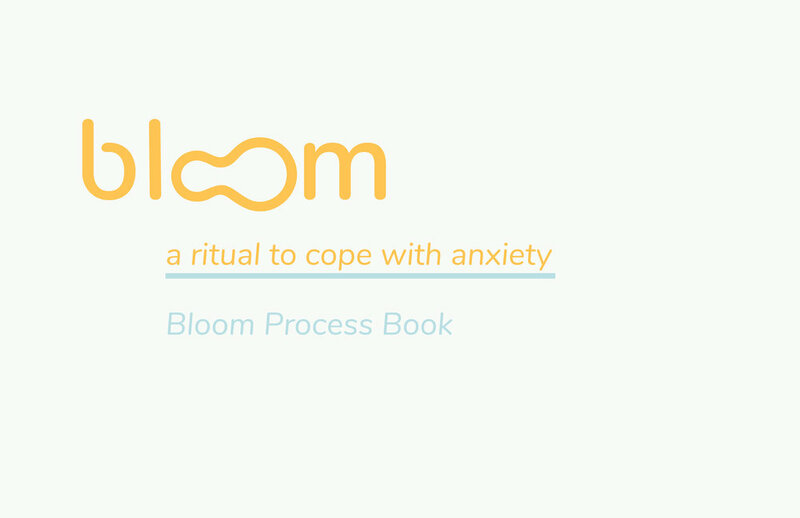 Bloom empowers these individuals to develop rituals around different coping mechanisms, to help them manage their anxiety proactively. Individuals should be mindfully preparing themselves for unexpected stressors rather than coping reactively. However, individuals are not taught to develop these proactive coping skills. As a result, 73% of the population regularly experiences psychological symptoms of stress, while 77% experiences physical symptoms caused by stress. Read more about how I started this project here. 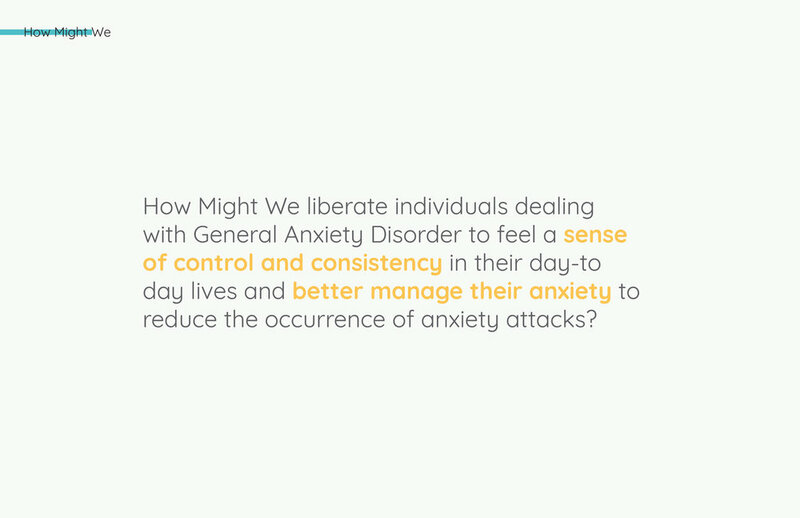 I conducted initial secondary research and a competitive analyses to learn more about General Anxiety Disorder and the exisitng services around it. Generalized Anxiety Disorder (GAD) is characterized by persistent and excessive worry about a number of different things, affecting 6.8 million adults. Cognitive Behavioral Treatment specifically targets thoughts, physical symptoms and behaviors including the over-preparation, planning and avoidance that characterizes GAD. Mindfulness based approaches have also been investigated with positive outcome. I interviewed individuals dealing with mild to moderate anxiety, to better understand their experience. This helped me validate some of my assumptions about General Anxiety Disorder. I was then able to develop validated personas through my research. Synthesizing the data from the interviews, helped me derive six key insights. This aided me in defining the scope of my project better. Individuals don’t have real-time feedback of their body, to clearly identify the on-set of an anxiety attack, as the symptoms are often confused with nervous energy or stress. Deep, normal breathing is crucial to reducing anxiety, which is challenging for individuals to do alone. The company of another living being is comforting for someone with anxiety, as long as there isn’t a high level of dependency on the individual to take care of that living being. Anxiety has a lot to do with pent up energy and incorporating regular physical activities significantly helps reduce those feelings of anxiety. Individuals dealing with anxiety struggle with a lack of control. Routines bring a sense of control and consistency that helps reduce anxiety. Knowing which activity helps an individual deal with their anxiety before an attack can prepare them to deal with their anxiety better. Through this process, I defined the key area of focus with the following 'How Might We' statement. The two key features that I wanted to introduce for this service were for 'Ritualizing' activities, and for tracking 'Anxiety Levels'. Shruti is prompted with activity suggestions related to mindfulness, physical activities, outdoor activities, journaling and meditating. Once Shruti performs an activity (at least once), she can mark the activity as a Ritual. This activity would then become a part of her daily routine, and Shruti will be prompted to perform her daily ritual at her preferred time. Shruti often experiences sudden bouts of anxiety, sometimes, leading to an anxiety attack, if she does not detect her symptoms. Shruti would be prompted to take the GAD-7 test as part of the on boarding process for the service. This would determine if Shruti has mild, moderate or severe anxiety. The wearable Bloom ring would track her 'Anxiety Levels' - a combination of her Blood Glucose Levels, Heart Rate, and Blood Pressure. 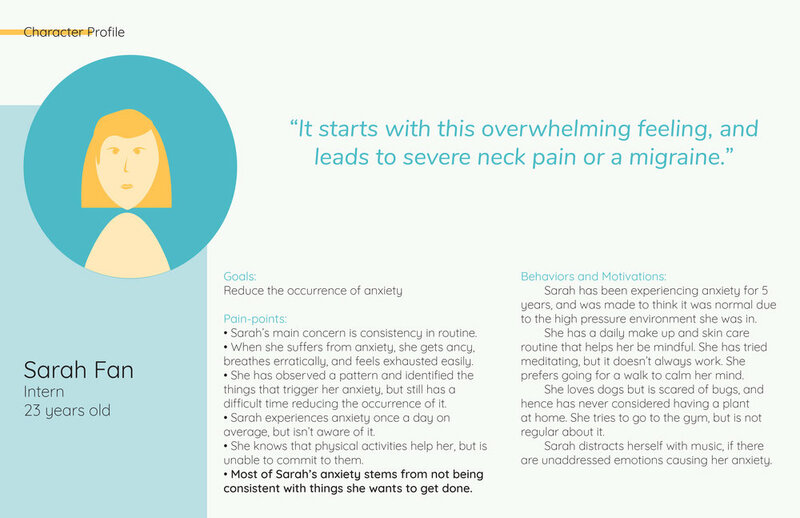 These measures combined with the result from the GAD-7 test, would help predict and prevent, or reduce Shruti's anxiety. I mapped out the key features I wanted the service to have with the help of a user conceptual model, design stories and taskflows. Creating user stories helped me differentiate how the Bloom service would work differently on different devices. 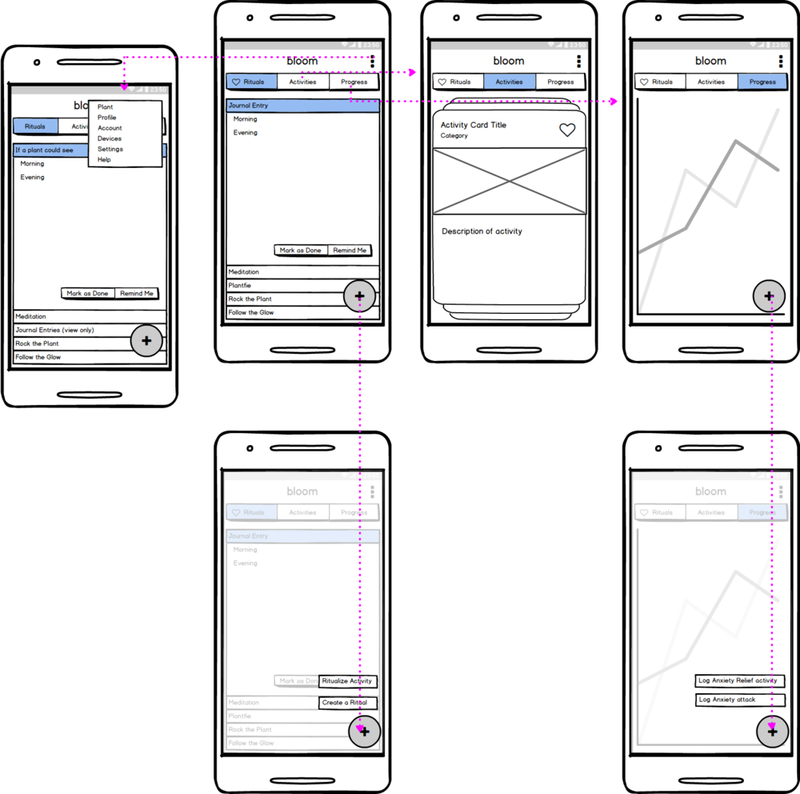 The taskflows then led to wireframes which helped visualize the screen-based experience. This process was iterative, and was refined based on the usability testing and wireframes below. I incorporated these modifications into the Design Stories and Task Flows. I then created wireframes to think visually. Activities range from spending time outdoors, to fun indoor activities, to be performed with the Bloom companion planter, and are focused on mindfulness techniques. Taking care of oneself can be anxiety enough. The Bloom service reassures individuals of their pet-plant's health with the help of embedded sensors that measure soil moisture and sunlight. Control and consistency are a key aspect of managing anxiety. 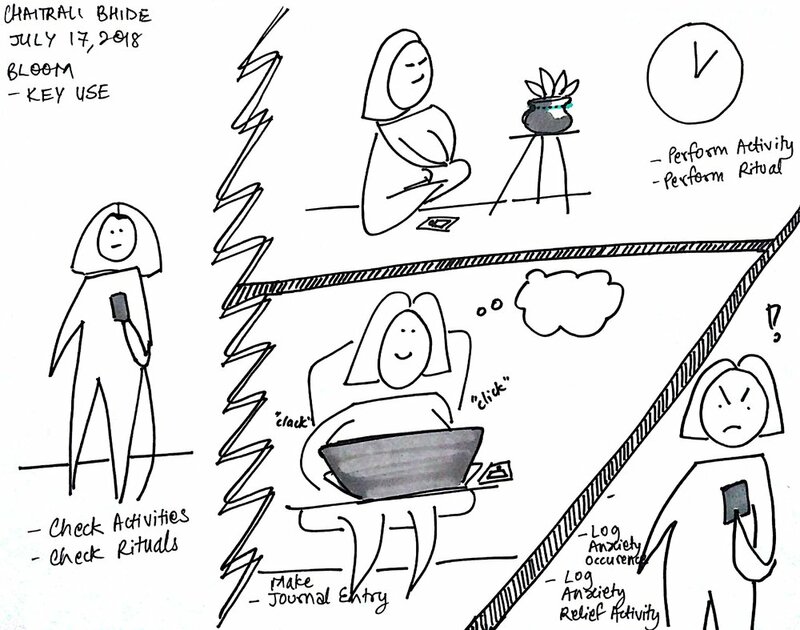 Individuals can choose to 'ritualize' certain activities by customizing how they want to incorporate these activities into their daily routine. The Bloom wearable and the application work together to provide information about an individual's anxiety levels. They can then log which activity they performed to help relieve their anxiety at any point in the day. You can view more of the iterative design process in the process book below.